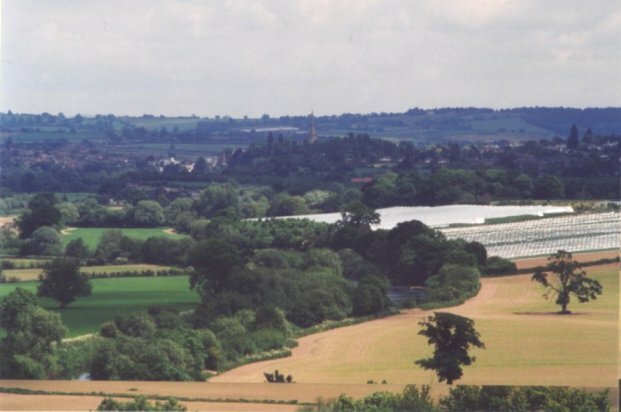 In December 2001 further enormous areas of land were being prepared at Kings Caple by Neil Cockburn of Pennoxstone Court in preparation for erecting more polytunnels. This is within the designated lower Wye Valley Area Of Outstanding Natural Beauty and an area of great landscape value. Individuals, the parish council and our MP had previously written to the council expressing their concern at this serious destruction of landscape within the AONB. At that time we believed the council were powerless to stop this. The beauty of the English landscape in particular the Wye Valley lies in its subtle blend of colour and light, muted green, red brown of soil, small fields, hedgerows and a rich variety of trees. a gentle undulating landscape where from the top of a hill views of twenty or thirty miles can be seen. The glaring, jarring, white of a single polytunnel disturbs the eye and becomes a prominent feature; a whole field then another and another gives it all the appearance of a semi-industrial wasteland. This seriously degrades the landscape and is incompatible with a designated AONB. Despite its clear visibility the authorities apparently decline to see it or feel the need to act the Parish Council and Member of Parliament and individuals have alerted Herefordshire Council and the Offices of the AONB to the ever-growing disquiet. As far as I am aware the position of Herefordshire Council remains as stated in their letter 12th April 2000. 1a. 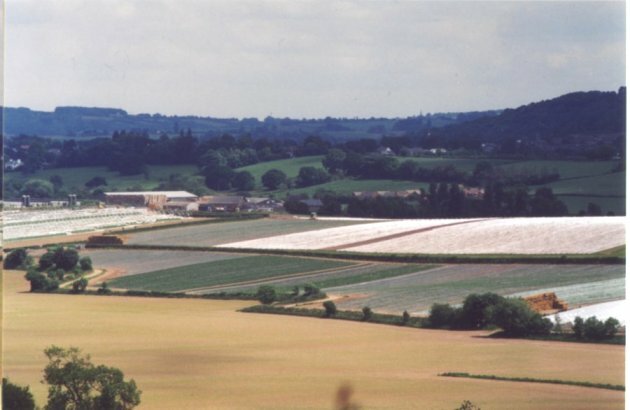 Herefordshire Council Planning Authority does not have powers to control the type of polythene tunnels being erected at Pennoxstone, Kings Caple. 2a. Herefordshire Council Planning Authority is not seeking to gain any such powers as the current controls are as laid down within the Town and Country Planning act 1991(as amended). It would be a matter for central government to undertake any revision of the Act. Where this method of farming is being used the incumbent authorities need to consider the detrimental effects this is having and it is encumbered upon them to seek solution. It is hypocritical and irresponsible to have vast acres of land falling under plastic farming whilst still maintaining that the area should continue to enjoy the status of AONB. 2a. To deregister it as an AONB but as Andrew Blake AONB Officer advised there is currently no mechanism for “deselecting”. Below are some of the issues and terms that are used in an attempt to quash or dismiss the argument or which are inherently misleading. It has to be clear, we are not talking with regard to horticulture, a single tunnel in a garden, but rows upon rows, miles upon miles, field upon field, acre upon acre, in undulating landscape not concealed by hedge or trees, glaring white- in-your- face plastic. At Pennoxstone approx twenty thousand hoops = forty miles of tunnel. 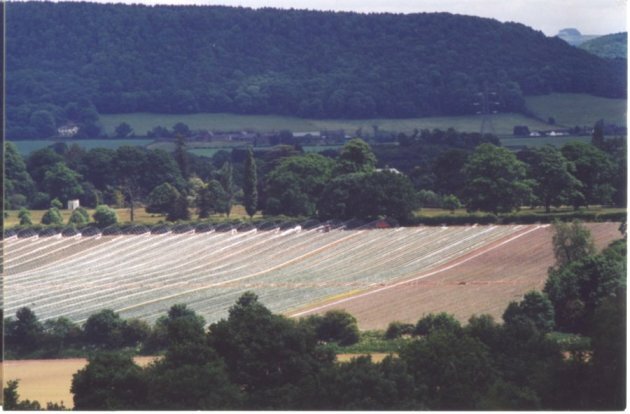 There are other and bigger and successful strawberry growers only a few miles away near Ross on Wye who refuse the use of the polytunnel on the grounds that it is an ugly intrusion into the landscape. The use of polythene as any one who has stepped off the plane in the south of Spain will witness has all but bottomed out. In parts the entire coast line is covered in plastic. This should be seen as a portent of the future here in this traditional fruit growing area. Look to the left whilst going south on the Monmouth road just outside Ross and see the newly erected “Hundred Mile” tunnel and other examples follow. 1� miles to the south lies Goodrich Castle and to the rear Chase Wood. This development is against the whole ethos of the AONB. 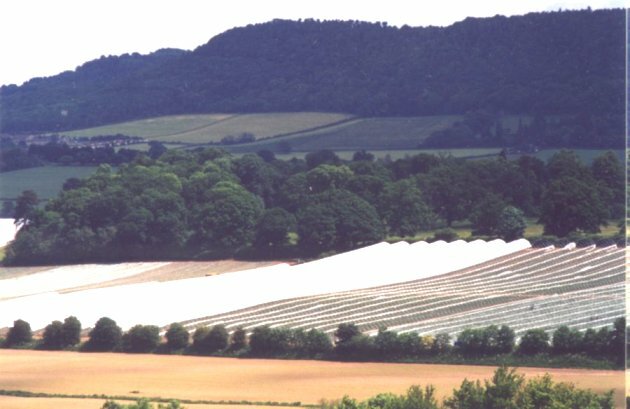 Polytunnels erected at by Mr Drummond at The Homme, Walford, alongside the River Wye, opposite Pencraig, approx 150acre site clearly visible from the A40 Ross-Monmouth. These photographs Illustrate the growers process of first covering land with polythene then raising hoops then plastic tunnel. This is neither a “Temporary Structure” nor a temporary business; this is a permanent and expanding feature in the Area of Outstanding Natural Beauty, all year, year upon year. Who is not aware and has empathy for of the plight of the farmer? It is not that we do not care for the plight of the farmer it is that we care for the landscape more. We object when industry pollutes our waters with chemical emissions. We object when the hospital protects the bad surgeon. 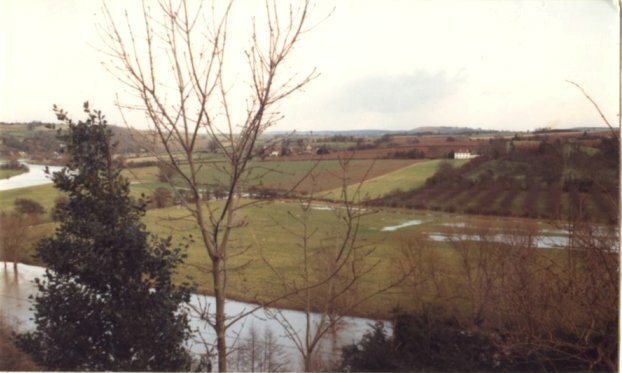 Erecting10 ft high polytunnels across the windows of a house were the occupiers previously enjoyed unparalleled views over the Wye Valley is ANTI SOCIAL. By taking the attitude that these are outside planning consents the Council have deprived the individual from making representation to curb the worst excesses of this method of fruit production and to object totally to its use in an AONB.